The techniques necessary to safely land an aircraft under varied conditions. The need to make meaningful decisions as to what type of landing should be made under existing conditions. A significant number of accidents and incidents occur during landing. What are the legs of a circuit? What are the symptoms of slow flight ? How estimate how far the airplane can glide? What does it mean if during descent a reference point is moving up on the windshield? A 10 per cent increase in landing weight has the effect of increasing the landing distance by about 10 per cent. As altitude increases, air is free to expand and therefore becomes less dense. Perfomance decreases with high density altitude. Performance decreases on a hot day. Landing into wind results in a lower groundspeed and shorter landing run. Takeoff and landing distances are reduced by about 1.50 per cent for each knot of headwind up to 20 knots. Gusty conditions also necessitate a higher approach speed, which results in a longer landing roll. Approach at higher speed if suspecting or reported. Add half the gust factor to the approach speed. A downhill slope increases the landing distance. Grass or snow cause an increased ground roll, despite increased rolling resistance, because the brakes are less effective. Long wet grass can mean a very large increase in the landing run due to this effect. Deposits on the wing surface, such as raindrops or insects, can have a significant effect on laminar flow. Stall speeds are increased and greater distances are required. Produce greater lift – lower landing speed. Produce greater drag – steep descent angle without increasing airspeed. Reduce the length of the landing roll. Turn when your aim point is at 45 degrees. In base, reduce power and start the descent at an airspeed of approximately 1.4 Vso and a rate of descent of 500 ft/mn (check airport chart). Extend flaps as required, but wait until final approach to extend full flaps. Establish and maintain drift correction. Be sure to complete the descending base to final turn at an altitude that clears terrain and obstructions. Many accidents have occurred as a result of stalling on the base-to-final turn. Avoid losing airspeed and/or overbanking at this critical point. If you overshoot the proprer final approach path, go around and try again. On a normal approach, with no wind drift, maintain the longitudinal axis aligned with the runway centerline. Extend flap to final setting. Adjust pitch for the desired rate of descent. Slight adjustments in pitch and power may be necessary to maintain the descent attitude and the desired approach airspeed. Approach speed 1.3 Vso (check POH). Stabilized approach, maintains a constant angle glidepath towards your Aiming point. Aiming point: It is the point on the ground at which, if the airplane maintains a constant glidepath, and was not flared for landing, it would strike the ground. Cross threshold at 15 to 30 feet AGL. Level off when the runway seems expending very fast. Look straight ahead beyond the end of the runway, to use your peripheral vision and see the rest of the area go up (means you down). If the speed is correct, as back pressure is applied the aircraft will begin to lose speed and start to settle. As the ground comes up continue to ease the control column back, flare. As airspeed decrease in the flare, the control become less effective and you must gradually increase the rudder and aileron deflection to maintain the proper amount of wind correction. Nose wheel aircraft should contact the ground on the main wheels first with no weight on nose wheel. Once nose wheel is down maintain straight with rudders. Keep the plane to the center line with rudder. Airplane weight concentrated on the nose wheel during landing roll. One of the most common causes of wheel barrowing is simultaneous touchdown on the main and nose wheel, with excessive speed, followed by forward pressure on the elevator control. Raise the flaps to reduce lift and to increase the load on the main wheels for better braking action. When the airplane contacts the ground with a sharp impact as the result of an improper attitude or an excessive rate of sink, it tends to bounce back into the air. Apply sufficient power to cushion the subsequent touchdown. Smoothly adjusting the pitch to the proper touchdown attitude. Discontinue the landing approach in order to make another approach under more favorable conditions. Adjust the attitude to stop the descent and begin positive rate of climb. 40 to 20 degrees of flaps immediately. 10 to 0 degrees of flaps at specified speed (check POH)and 200/300 feet agl. Climb at Vy and trim. The climb out patch depends on the traffic in the circuit, usually you will turn and join mi-downwind. If the you feels that a clearance for landing is unacceptable (for example the approach is too high for landing properly), immediately inform ATC. A narrower-than-usual runway can create an illusion that the aircraft is higher than it actually is, leading to a lower approach. 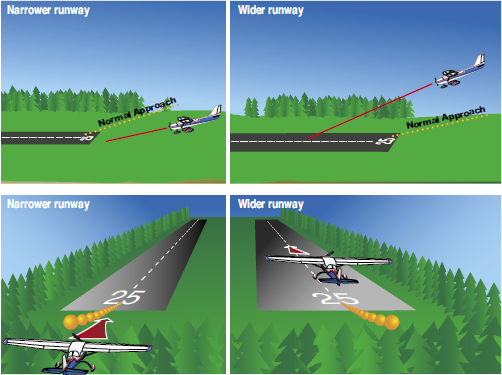 A wider-than-ususal runway can create an illusion that the aircraft is lower than it actually is, leading to a higher approach. 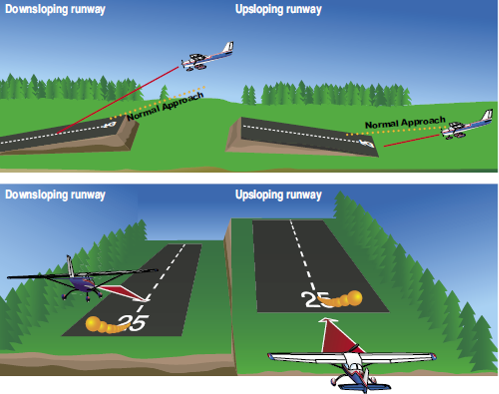 A downslopping runway can create the illusion that the aircraft is lower than it actually is, leading to a higher approach. 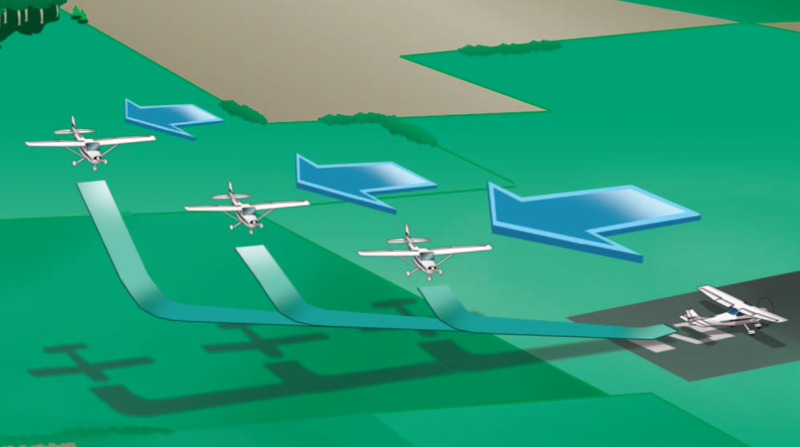 An upslopping runway can create the illusion that the aircraft is higher than it actually is, leading to a lower approach. What’s the Rule of thumb for the approach speed ? While on final approach, if the arplane’s descent angle is too shallow and the airspeed is too low, what action should you take ? What are the advantage of Flap extension during landings ? How do you judge if you are low on the approach, how do you correct it? How do you control your airspeed on the approach? What wheel should touch the ground first ? How do you recover from a Wheel barrowing?